Reflective insulation is an effective means that allows reducing the heat loss thanks to the decrease of the heat exchange between mediums. Aluminum foil is used as a reflecting layer in the reflective insulation which helps to achieve a good reflection coefficient and to provide a high corrosion resistance. Reflective insulation is used in such fields as industrial engineering, automobile industry, shipbuilding, for building interior, saunas and baths finish and for installation of ventilation systems and various piping. Reflective insulation field of application is very broad. 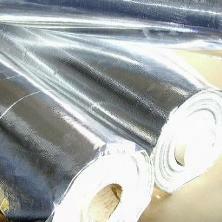 Different types of reflective insulation have different features. For example, FCC-C Thermal Insulator is a combined material consisting of 20 µm aluminum foil reinforced with 20 µm PET film and a fiberglass mesh. One side is covered with the adhesive layer covered with the antiadhesion layer pad. This reflective insulation is used for the insulation of conditioning and ventilation systems but is not good for the creation of a heat-reflecting layer for finishing because of its high cost. Reflective insulator is a material that allows reducing heat loss and preserving heat which is an important factor for reducing of economic costs for the heating and maintenance of steady temperature conditions in residential and industrial buildings.